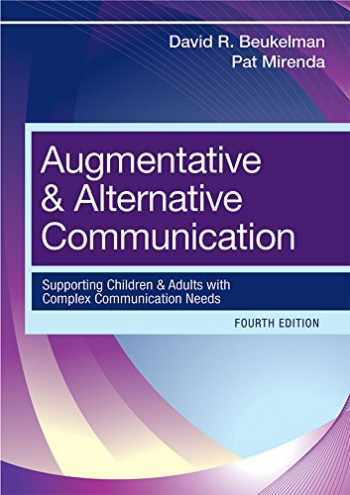 Acknowledged author David Beukelman wrote Augmentative and Alternative Communication: Supporting Children and Adults with Complex Communication Needs, Fourth Edition comprising 616 pages back in 2012. Textbook and etextbook are published under ISBN 1598571966 and 9781598571967. Since then Augmentative and Alternative Communication: Supporting Children and Adults with Complex Communication Needs, Fourth Edition textbook received total rating of 3.5 stars and was available to sell back to BooksRun online for the top buyback price of $30.41 or rent at the marketplace.